Image caption A universal human expression? Laughter is weird - and we do it a lot. One study found that people laugh seven times for every 10 minutes of conversation. We don't do it when we think we do. It's been found that if you ask people what makes them laugh they'll talk about jokes and humour, but we laugh most frequently when we are with other people - and hardly ever at jokes. It's a social emotion and we use it to make and maintain social bonds. We also make very strange noises when we laugh - from wheezes and squeaks to gasps and snorts - and each sound simply reflects the muscles in the chest squeezing out air from our ribcages under very high pressures. My laugh is very high-pitched, far higher than I could produce when trying to sing, for example. Laughter is also a very primitive way of making a sound. MRI images show that when someone laughs, there is no real movement of the tongue, jaw, soft palate and lips. All the action is happening at the ribcage. Laughter is a non-verbal emotional expression and these sounds, which we typically make when in the grip of quite strong emotions, are more like animal calls than they are like our normal speech. We make them in very simple ways (unlike speech) and they are controlled by an evolutionarily "older" brain system, one that looks after vocalisation in all mammals (unlike speech). This is why a stroke can rob someone of the ability to speak, but leave them able to laugh and cry. They have suffered damage to the brain areas that enable them to speak, but the older emotional system is still intact. These non-verbal expressions are frequently associated with expressions of emotion. The emotions themselves are called the "basic" ones, because they're recognised by all human groups and are also found in other mammals. This explains why some emotions are quite similar across species - think about similarities between the face of an angry human and an angry wolf. 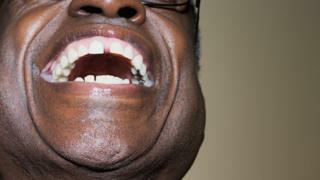 People recognise laughter as laughter even if it is produced by someone from a very unfamiliar culture. My collaborators Disa Sauter and Frank Eisner went to Namibia several times to work with the Himba people and the only positive sound that the English made which the Himba recognised (and vice versa) was laughter. Other, very positive emotions such as triumph, which are meaningful across cultures, are expressed very differently in different cultures and so are not basic expressions. For example, in the UK, it's not unusual for people to cheer to express triumph, while the Himba people produce an almost song-like "ay-ay-ay" sound when they are celebrating. Of course, we are certainly not the only animals that laugh. Laughter has been well described in other primates such as gorillas, chimpanzees and orang-utans - as shown in this video, where a zookeeper is talking about the slightly nerve-shredding activity of tickling a gorilla and how it makes her laugh. Laughter has even been described in rats, so it's at least possible that there is more laughter out there in the mammal kingdom. And intriguingly, wherever you find laughter, its roots are in tickling and play from humans to gorillas to rats. All mammals play when they are juveniles and some mammals (like humans, otters, rats and dogs) play through their whole lives. Maybe laughter has evolved to be an important signifier of play - a sign that we're having fun, no-one is going to get hurt and this is all a game. There is even a theory that this is what happens in comedy - people are using communication in a playful way and this is why we laugh. Maybe the roots of all laughter still lie in social interactions. Jimmy Carr and the Science of Laughter is on BBC Two on Sunday 11 September at 2100 BST and then available on iPlayer.